The ice started to recede on Two Jack Lake in late April this year. 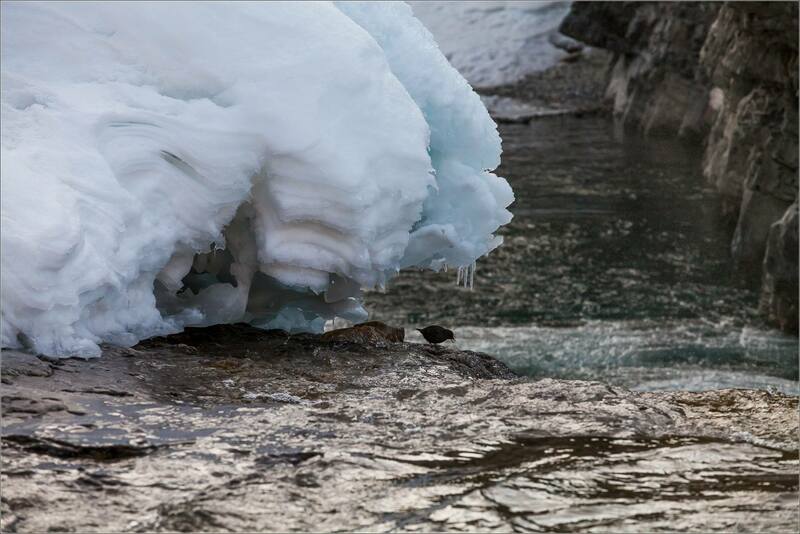 Waterfowl was drawn to the open water as they migrated back to Banff National Park. Some birds were resting briefly before continuing further north. For a small gaggle of Canada geese, they seemed to be planning for a longer stay. At one point, one goose decided to chase another. The target flew off and was joined by his mate and they landed at another opening. Perhaps this was a territorial “discussion”. For me, it yielded a series of images with the aggressor splashing, flying and skimming across the water. 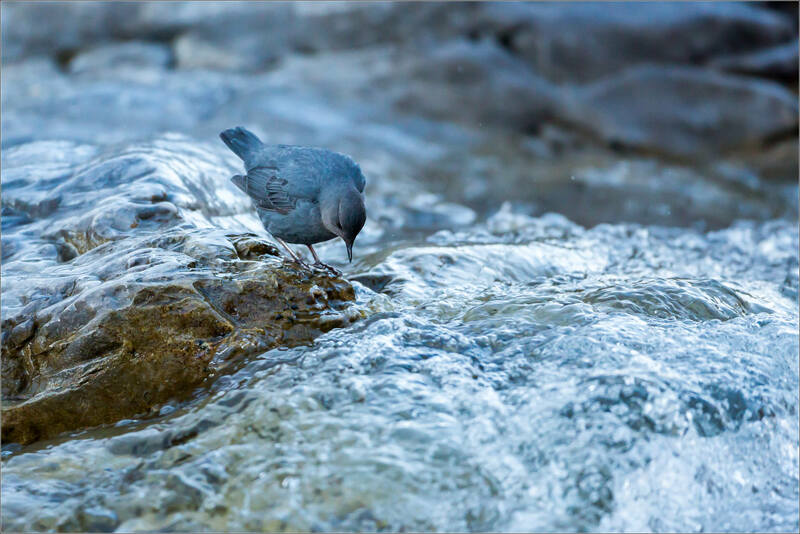 The bird banked around the small cove towards me so I was in a great position to photograph him. The remaining couple settled down quickly and returned to paddling on the water. A little while later one laid don near a stand of trees while the other went to the edge of the ice that still covered most of the lake. The tall grass near the bird blind on Frank Lake is nesting ground for Canada geese, ibis, yellow-headed blackbirds, herons and more. At dusk the cacophony rising up from these residents can be surprisingly loud. 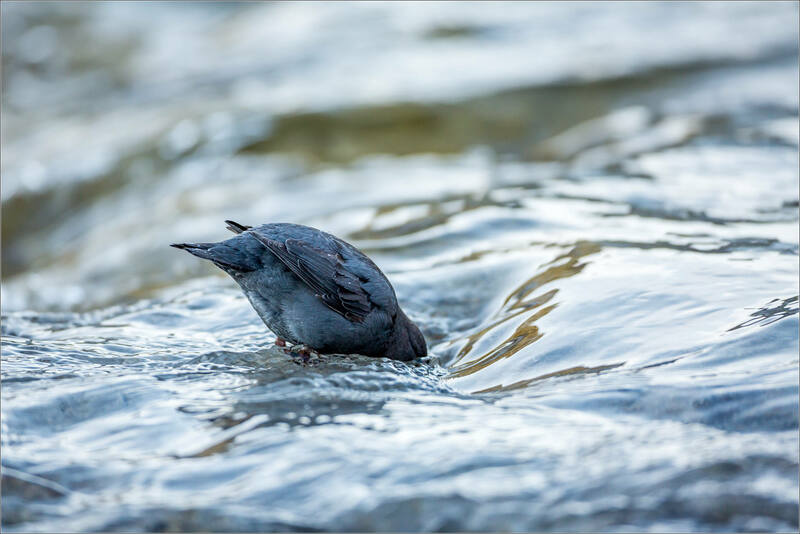 There are birds chasing one another, others returning with material for their nest, food for their chicks as well as occasional territorial spats. It’s an incredible spot to set up near the trails and watch life on a marsh. On a visit there in early May the weather was warm and the sunlight before dusk was incredible. Throughout the evening, the Canada geese were active with a couple being particularly feisty. That presented some new image opportunities that I had not yet photographed which is always exciting for me. When the sun set, the activity level along the shoreline rose noticeably. All manner of birds flew overhead and low along the water. Some of the geese moved their skirmishing to the small pond directly in front of me. I didn’t move around and they seemed oblivious, or at least undistracted, by me – which was perfect. I stayed until it was dark and loved every minute. This summer’s weather – rain and sunshine in a daily tug-of-war – has been a perfect gardener for the wild Buffalo berries. 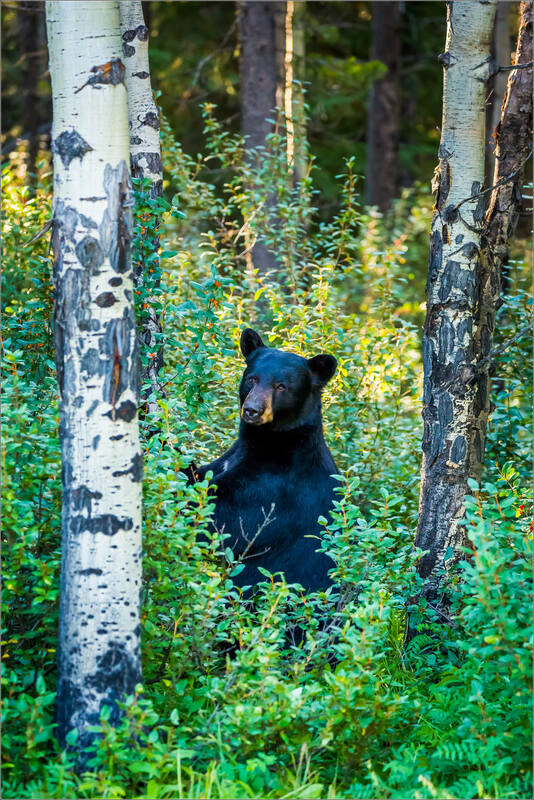 These have ripened over the past week or two and are drawing in the bears throughout Kananaskis. This Black bear made it easy for me to find him when he sauntered across the road a couple of hundred metres in front of me. 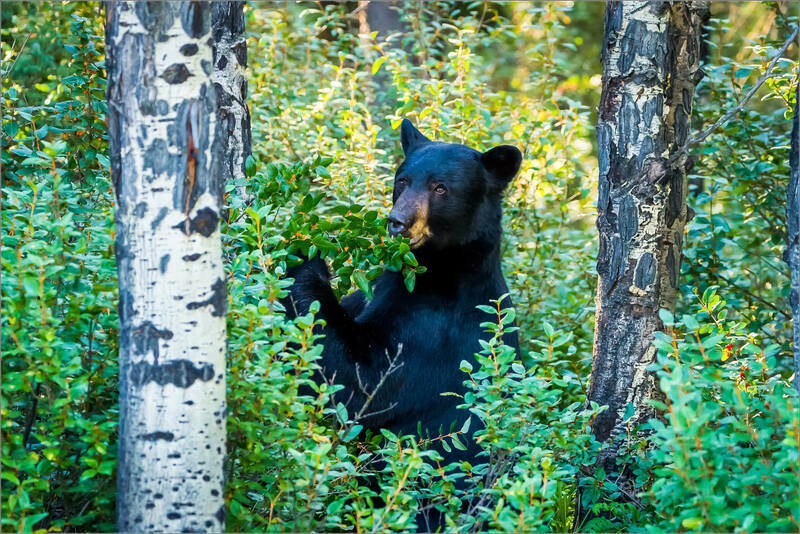 I pulled up to find him standing up in the middle of a patch feasting on the berries. They are a great source of calories for the bears so it is wonderful to see so much fruit this year. Some years are not nearly as abundant and it seemed like that was not lost on this beautiful bear. He appeared to be relishing almost every bite. 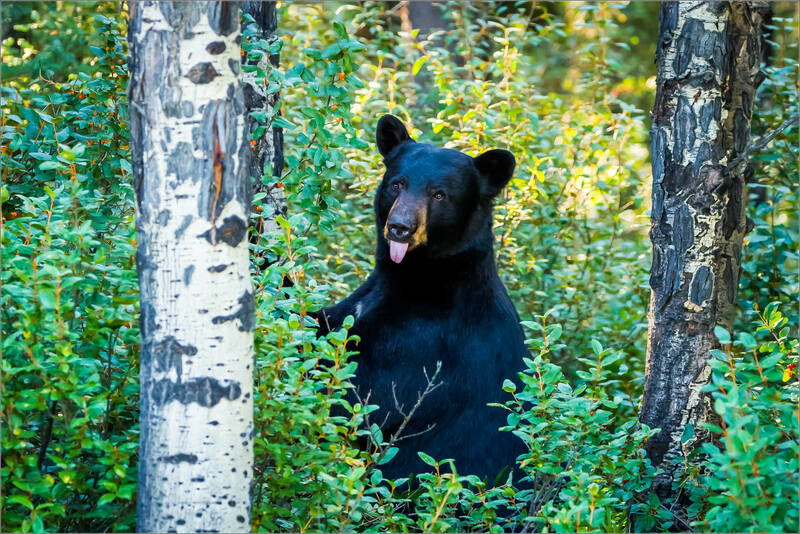 The berries stretched back into the forest and he slowly made his way further back as he ate. I lost sight of him shortly after these pictures but could see branches bend and hear the odd one crack for several more minutes before he vanished back into the wilderness as they often do. 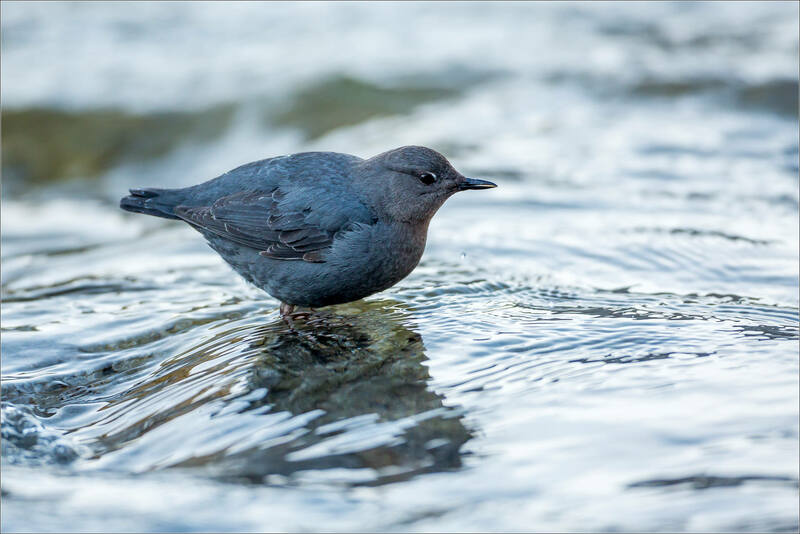 I went up to Elbow Falls last weekend for the sunrise but I stayed for the American Dippers (Cinclus mexicanus). 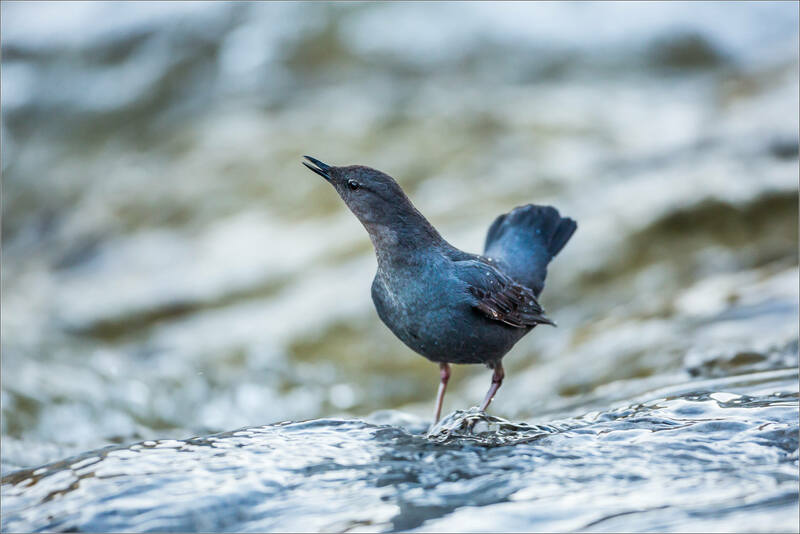 I love watching these aquatically adept birds stalking, diving and swimming in the middle of the rapids. 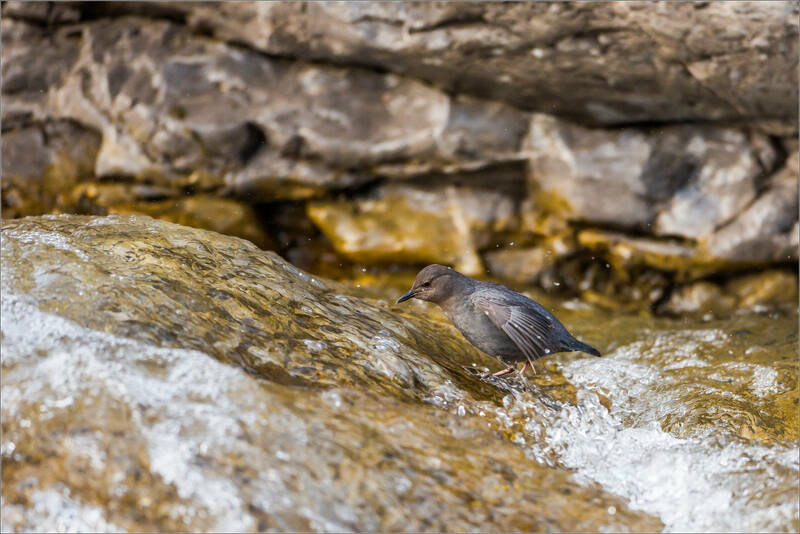 On the last visit to the waterfall, there were three Dippers flitting about moving between the bottom of the waterfall and the rocks at the top. They chased each other down river a couple of times but spent most of their time fishing alone. On a quiet morning in Kananaskis, it was nice to spend my time watching them. 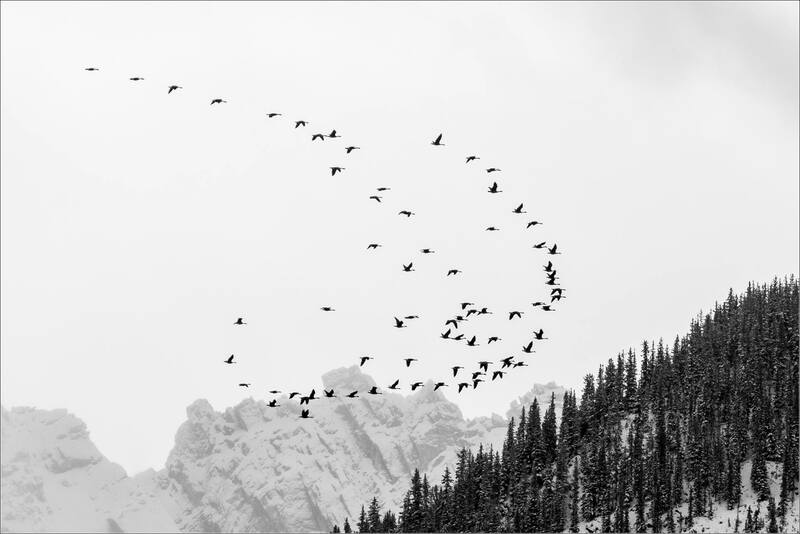 A skein of Canada Geese (Branta canadensis) broke from the standard V formation as they navigated through the Bow Valley corridor. 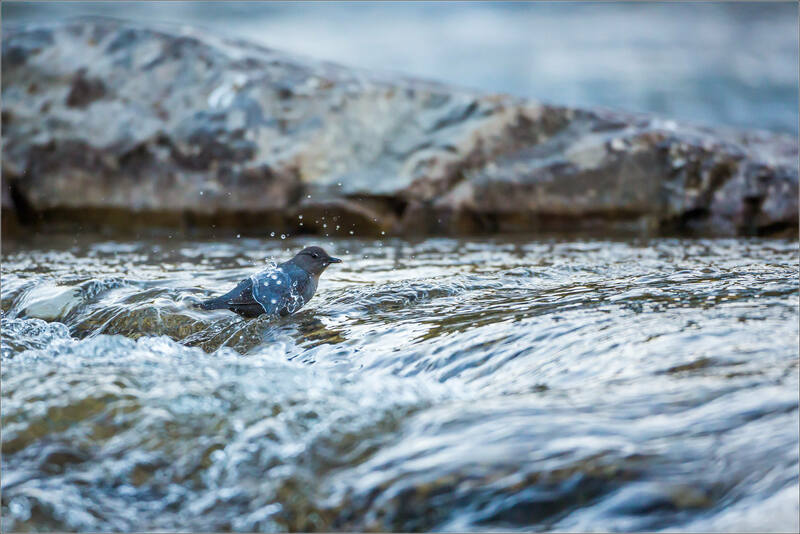 It may have been wind shear out of the mountains that pushed the birds around but as I watched them rise over a forested hill and bank around a massive peak, I had a notion they were playing as they flew along. Very likely just my imagination having a bit of a run but I enjoyed watching the constantly changing pattern created by their silhouettes against the Banff National Park’s early winter landscape. I spent several hours over the weekend on the trails and along the river down at the Inglewood Bird Sanctuary in Calgary. The Mallard ducks and Canada geese flock to the rocky islets in the middle of the water every evening. In the morning, the geese flew back out to the fields while most of the ducks preferred a slower start to the day. 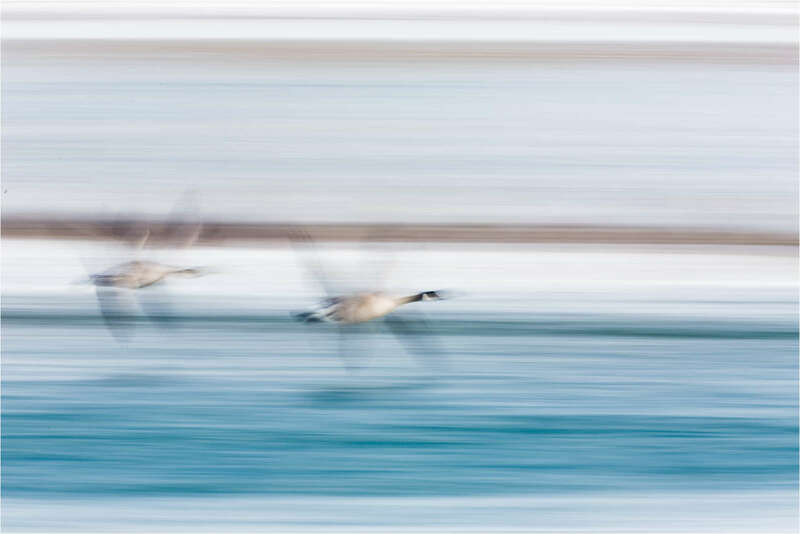 Here, I dragged the shutter to a 1/4 of a second and panned with this pair as they flew down river.